I'm sheepishly stepping forward as a complete newbie on here, but given what I've read across postings here in the last day or so, there's a great deal of incredibly friendly folk on here, so forgive, me if/when I bump into everything & do it all entirely wrong. I'm a quick learner though. I bought a print off Shepard in 1999/2000 at small group show when I first moved to London, namely the Big Brother Offset, edition of 200. Unfortunately I need to let it go, but I've no idea for how much. It's in immaculate condition, & I don't think I ever got round to actually hanging it, being it has an fantastically intense presence (I'm older & calmer now). So it's lived in it's original tube all these years. I'll attach some pics (if I've done it correctly) of it including edition number & initials on the back. Any & all help would be appreciated. & again I hope I haven't posted this in the completely wrong section, ie sending an all desk email, to the entire company. Thanks for all your help in advance. "I am about to undertake the journey and this is a journey to tell you the truth which I always knew that I would have to make." Very very cool print. You should hold on to it. I'm in London, so there may be a delay in my responses. Cookie Head, yep, there's no full signature. I'm not sure how I never got it signed at the time. I was probably too excited at the event. There was (& still is) a genuine love of the work/creativity, not the ownership or resale value, so I honestly just didn't think about it. I still prefer work on the street rather than in galleries etc. That's not a criticism at all mind, to each their own. & I'm sure it could be signed easy enough should Shepard be knocking around. Have you any idea of the value difference (not actual figures), percentage? Thanks for the expresso beans tip too, I had seen it mentioned & planned to sign up, it's just the conversations on this forum were more to my liking. submethod, ideally I would hold onto it. It's still as vibrant/intense as the first day, but there's imminent bills to be paid, & I paint/draw/create too & there's a project I really want to start that the money would come in very handy for. I really appreciate the feedback though, thanks peeps. Welcome to the board! 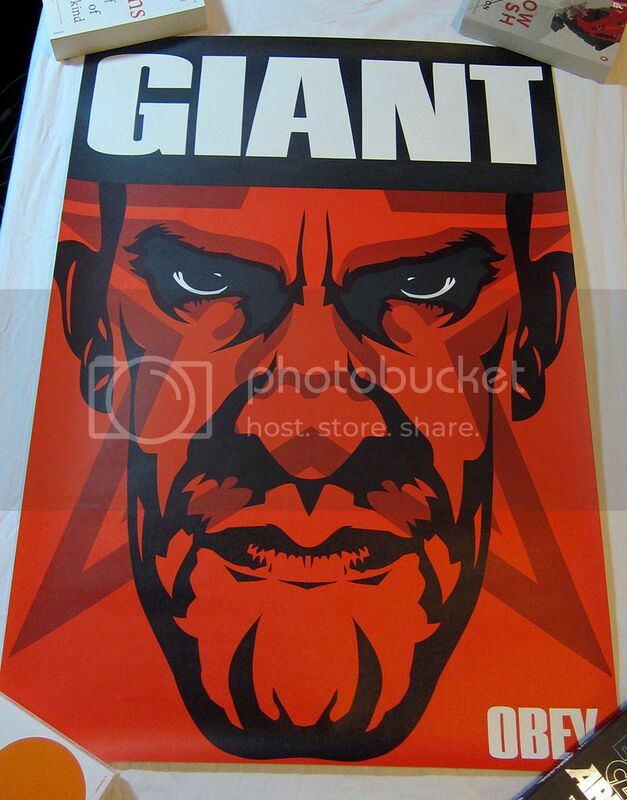 That's a great piece and with it's size and image it makes for a fierce print. Not to many of these shipped well back in the day so a lot of them got dinged up in delivery and have some condition issues. This is the larger offset litho version of the 18x24 serigraph. Lacking the sig is unfortunate, but he would sign it at a show today. It's only a run of 200, from '99, and low edition number of 7. You could probably get $400 from the right individual buyer, though gallery would ask for more. Thanks very much for the welcome. My brief interactions have already proved me right by coming here first, decent folk indeed. & thanks for the all the info too. The more knowledge I have will hopefully make me make a more informed decision (hopefully). At this point I'm more gathering potential value. Ideally I'd never let it go, but bills & my own projects I want to fund are crying out for attention. I'm not surprised a lot of the prints got damaged in transit, it's a somewhat flimsy tube to say the least, thankfully I picked it up myself at the show. Can I ask how much you might speculate it may go for if it had a signature? & indeed, where would I keep an eye out for appearance dates (UK) other than the obey site/twitter? & thanks to the other members who replied, you all admirably represent this site. Well this could turn into a lively debate, but I'll take a stab. Signatures on prints help to do two things: first, to establish provenance and second, to corroborate the artists involvement in the piece. Or course, that isn't to say that unsigned prints are not authentic or that all signed prints were made by the artist (see Dali). Some artists signatures bear more weight than others depending on their propensity for signing their work. To the first point, there is no doubt in my mind that your print is genuine and to the other, that Shepard produced it. 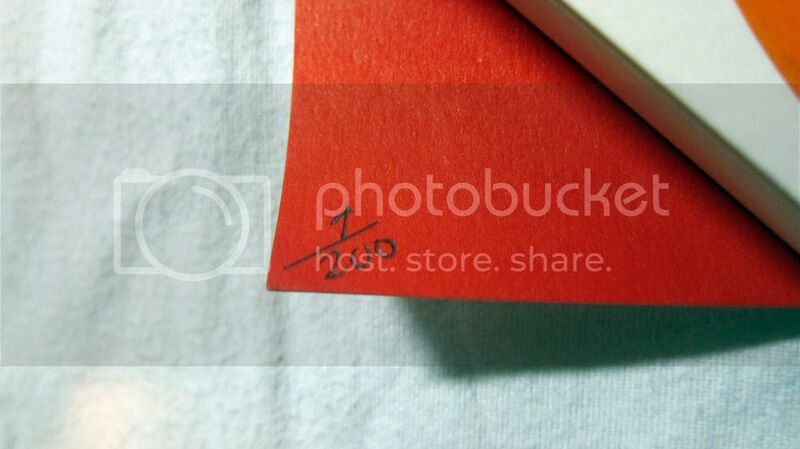 So I don't believe that you will find yourself having to validate the print's authenticity to a buyer. That said, people like sigs on their prints especially from famous artists. There were some prints from those days that people absconded from the studio before they were signed and are looked down upon as ill-gotten, though still legitimate. If that were the case, Shep may be reluctant to sign it today though he is typically very liberal with his sig. He'd probably sign an MBW print if you asked him to. 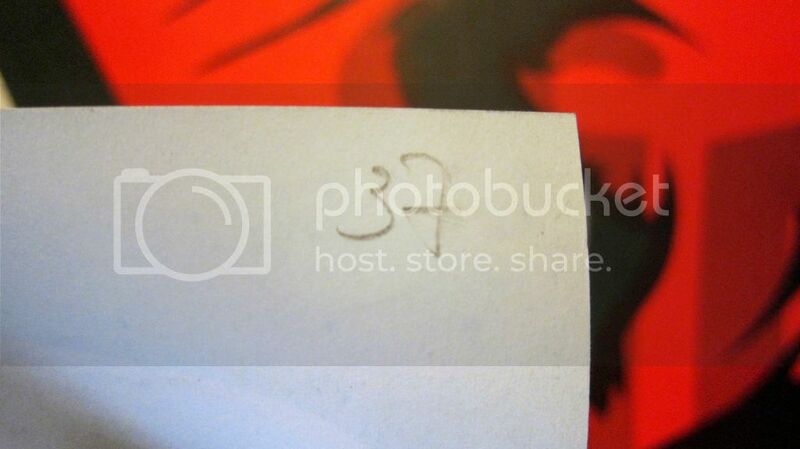 Thus, his sig is not rare, the way a Banksy sig commands a premium. I would speculate that a back sig on this print, as opposed to originally signed at the time or printing, would only move the price around $100-200. You can check the "Prints and the Revolution" thread on this board and follow Shep on Instagram for his shows and appearances. Last edited by cybernigel on Tue Apr 04, 2017 10:50 pm, edited 1 time in total. That's all genuinely really interesting stuff cybernigel, thanks very much indeedy. It's much better to have clarification from those heavily involved in the scene. I've no problem showing my lack of knowledge, but I do aim to learn from folk who know what they are talking about. In a great way it's like being back at school, but you REALLY want to be there. oh! & to back up an earlier point I made, the response on here has been wicked. I was right to join this forum first. And I'm very appreciative of the shout backs. yep, I actually agree with you no1gdman, it does look like a 37 too, which I initially thought was a bit disheartening. but then I saw loads of his signatures where the 'F' was the very same cursive joined shape (not sure if the entire pencil line is showing in the pic, I'm writing this on my phone), & the 'S' was just missing the long intro tail that starts his signature, & it's maybe 18 years ago, & signatures do evolve. that's my sherlock holmes opinion though, I could be entirely wrong (hope not), but it's how we signed our prints soon after they came off the press in college prior to fully signing them later. & it's how I sign proofs from the printer today. I'll hopefully get it fully signed soon though, so it'll alleviate any doubt. but you're definitely right to mention it. Ah that makes more sense. I've never seen just his initials only full sigs. I'm not sure if I saw it on this forum or on EB, but someone had compiled a list of his signatures throughout the years. phoresttphyre wrote: learn from folk who know what they are talking abouts. Please bear in mind, I am but a simple squirrel. There are other astute collectors on here who may have different, yet completely valid assessments of value. I spoke to another collector yesterday who has a mint signed version of this print and said he wouldn't let it go for less than $800. Market value though is determined by the buyer (i.e. what someone is willing to pay).